Mumbai, 1st October, 2016: JP Infra Mumbai Pvt Ltd, one of the leading Real Estate Major, today announced the Masterplanned Neighbourhood- ‘North’ would be undoubtedly the new residential destination at Mira Road with the world class amenities. Surrounded by lush greenery, ‘North’ is going to redefine living habitat at Mira Road. Moreover, JP Infra announced their factual developments and upgradation about their project in the Press Conference at Intercontinental Hotel. While launching North earlier, JP Infra had announced a macro view of the project with a limited factual details. The group has signed up with internationally acclaimed master-planners P&T (Singapore) to come on board and turn landmark project into a master planned neighborhood. Initially, the project was planned on 22 acres land and now it is being built on 27 acres land. The master planned neighborhood would now be having 33 different kinds of gardens with a very well equipped resort style clubhouse of 29,ooo sq. ft. Further addition to the list of commitments, JP Infra has planned to built an International school and Ganesh temple in the premises. North is the result of the collaboration between the company and leading acclaimed master planners who addressed the media at the Press Conference. They are the prominent names like Richard Soon, Architect, P&T Singapore, Mr. Rohit Kumar – Tesla (Water conservation consultant), Mr. Ashwin D’Silva – 3 S Envo (Solid waste management consultant), Dr. Siddharth Saxena – KWatt Solutions Pvt. 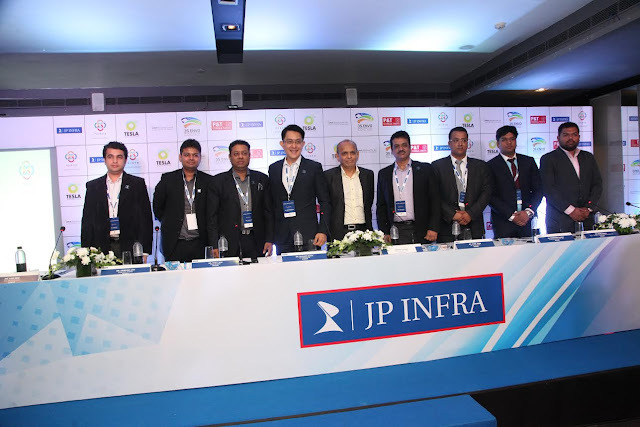 Ltd., Mr. Vijay Jain – CMD JP Infra, Mr. Shubham Jain – Director JP Infra, Mr. Vivek Joshi – Sr. VP Projects, JP Infra Mr. Amit Rede – GM Architecture, JP Infra. They illustrated the evolved design and layout of the project during the conference. JP Infra has also collaborated with Reza Kabul and WAHO (New Zealand) as design and landscape architects. This is one of its kind masterplanned neighbourhood in the entire Mumbai’s western built to Mira Road. North will offer an exceptional quality of living to the people residing. The residents will be able to save money and energy with solar powered heating, water harvesting, underground water tanks and waste management- all combined with careful resource management. North will offer a variety of residences ranging from 1-BHK and 2-BHK luxury apartments. In addition, it will have cycling and jogging track, and water bodies. Mr. Shubham Jain, Director JP Infra concluded, "Our aim is to create spaces where people can truly live. With North, we are actually defining the way life needs to be lived. As a principal, we try to surpass our customer’s expectations in terms of delivering much more than a home to them. With JP North, We had promised to deliver a planned community at Mira Road. And we are happy to change that plan. We have added 5 acres of recreational space, changed the clubhouse into a state of the art health and leisure complex, increased the number of gardens, put in a Ganesha temple and a school. It's time you experience 27 acres of living space in nature." Moreover, JP Infra has also rolled out a radio and digital campaign #BreakPromisesForGood. First time the builders fairly accept that they are breaking promises they made while launching North, Mira Road. However, the promises are broken for good this time. When the project was launched, there were no factual announcement, however, now things are in place and planned, JP Infra is refuting their promises and upgrading their deliverables. The campaign is an eye-catcher and is attracting people’s attention through their quirky phrases. Through this campaign the builders are spreading the message- ‘Not every broken promise hurts’.